At the 2015 Australian Wooden Boat Festival. Image: David Payne / ANMM. 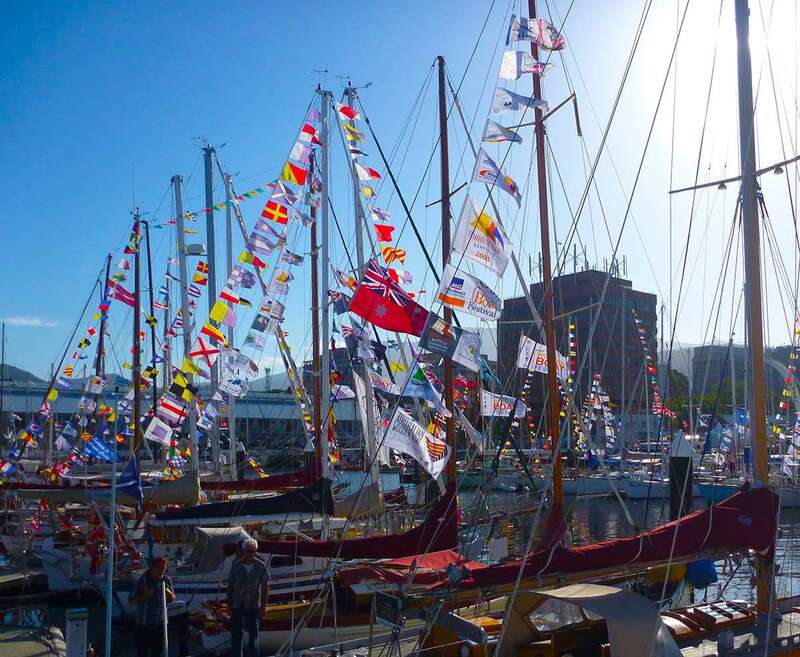 The 2017 Australian Wooden Boat Festival in Hobart starts this Friday 10th February, and the Australian National Maritime Museum will be very well represented at the festival over the weekend. A contingent of staff is travelling south to attend and help with various activities. The museum has a booth in the principal display hall on Princes Wharf and is hosting a cocktail evening on Saturday. It is the sponsor for the AWBF Symposium of speakers which runs over three days, and is a key organiser with Maritime Museum of Tasmania for the Australian Maritime Museums Council’s Conference that proceeds the festival. The Voyage Game will also be a feature at the festival. The Australian Register of Historic Vessels will be there for the AMMC Conference and AWBF, as it has been since 2007. In that year the register was launched at the AWBF, and is proud to mark its 10th year by launching a new website at the Symposium, and highlighting the ARHV’s Tasmanian research assistant position. At the 2013 Australian Wooden Boat Festival. Image: David Payne / ANMM. The AWBF is an internationally recognised event on the classic boat calendar, and as well as attracting visitors and enthusiasts from around the world, there is always an international flavour to the festival. The Symposium includes speakers from North America and Europe, but the big news is that the Dutch are returning! To put it correctly- “the Kingdom of the Netherlands is the AWBF’s special guest, marking the 375th anniversary of Abel Tasman’s visit to this island”. The festival began in the 1990s as a get together of wooden boat owners and raft up of their diverse collection of craft, and the enthusiasm of the group kept the continuity going. It soon became a key event in the Australian boating community. As the scope of the festival and its footprint grew, it was matched by an ever-increasing flow of tourists to the state. The AWBF has now grown into one of Tasmania’s significant events, with wide corporate and government support. The Symposium has become a key element of the AWBF programme and with the museum’s support it has spread to cover two and half days of speakers, covering a wide range of topics. The museum has three speakers: Dr Nigel Erskine will discuss the search for Endeavour, Indigenous Programmes Manager Donna Carstens will talk about Indigenous watercraft, and as noted the ARHV website will be launched by myself, along with Peter Higgs, the museum’s Tasmanian based research assistant. Former staff member and now ANMM honorary researcher Jefferey Mellefont is another speaker, and the symposium will be opened on the Saturday by director Kevin Sumption. Other speakers include Ben Mendlowitz from USA, and designer Ron Holland from New Zealand and now Ireland. SY Preana at the 2013 Australian Wooden Boat Festival. Image: David Payne / ANMM. The Dutch presence includes a traditional BM16m2 yacht they have been building in Franklin, as well as a display of small craft and match race between their Regenboog Oranje from 1931 and Gnome, a Tasmanian Derwent One-Design from 1927. Elsewhere the “Quick and Dirty” boatbuilding is again a feature, and there are plenty of other demonstrations and entertainment going on around the wharf areas. Friday’s parade of sail is always spectacular, and so is the food available all weekend, all topped off by around 500 wooden vessels afloat and on shore – the primary element of an amazing festival. Hobart’s Australian Wooden Boat Festival runs from 10-13th February 2017. Explore the historic vessels of the Australian Register of Historic Vessels on our new website.